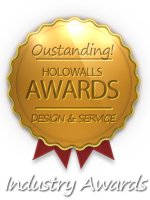 Why should I use the Holo-Walls films? The real question should be why not use the Holo-Walls film. Its new, different and can add a whole new dimension to any display, set, exhibit, interior or exterior application. Anyone can get a large state of the art lighting system but in the end, they all just do the same thing and is no different than anyone else except maybe with more lights than the other guy. With our durable, polyester films, they work in harmony with the lighting system to provide an array of beautiful colors, dimension and depth with any of our spectral films. With Steel-Wall films, now you can dive into a whole new world of incredible "faux" metallic patterns without the hassle and expense of real metal. These patterns can be used in ways that would be too costly or unrealistic with conventional metals. Because of the thin nature of the Steel-Wall line of films, you can create unique designs not possible with metal rolls or sheets. We had one client wrap a piano in a film so it appeared to be totally constructed of metal. What types of lighting should I use with the product? Our films work incredibly well with all types of lighting - natural or artificial. In fact, we say they are "self-illuminating". With our colored films, any automated lighting instrument that employs dichroic color changing or LED systems bring out incredibly beautiful patterns and can even appear animated and interactive with the viewer. Each film provides a unique effect and you can choose which film will work in the environment you plan on using it in. Certain strobe lights are also effective in providing a very unique effect. We suggest experimenting with all types of lighting to achieve your desired look. In addition, when the lights change color, the film reacts only to that specific color without losing its dimensional properties. Even some of our Steel-Walls film work well with lighting. For example, our Mirror Metal-Chip pattern acts like facets in a diamond picking up colors from all different angles and appear to "glow" and "shimmer". How are the films applied? All of our films come standard with a pressure-sensiitve peel-off adhesive for quick and easy installations. For high traffic, high abuse areas, we recommend our Holo-Floor Straight Lamination where our film is bonded onto impact/scratch resistant polycarbonate. Our Holo-Floor2 films and Gloss Vinyls products are sold with a temporary, removable adhesive. This is great for dance floors but are also used for temporary displays where product will be used only for a short period of time and needs to be removed without leaving residue. Can I apply these films to dance floors and will it rip or tear? Yes you can use our Holo-Floor 2 or Gloss Vinyl products with removable adhesive. This can be applied to all types of floors – wood, vinyl, marble, granite. Typically, this is used with any type of portable dance floor system or stage surface. Other surfaces include walls, sets, displays, etc. Our Holographic Film is a 2 mil polyester film. The only way to rip it or tear it is with a knife or other sharp objects. Since its debut back in 2005, clients have shared with us many success stories with the product from a roller blade troupe performance on the floor and others - to hundreds dancing on it all night - the only "damage" were heal scuff marks! How long does it take to install the film on a dance floor? Depending on size but for a 30 ft. X 30 ft. floor, it would take two people about 2 – 3 hours to install. Less time with more people. Where time may be an issue, then applying on portable dance floor tiles is best done in advance. The floor should be the last component installed to avoid other vendors from walking and moving equipment across the floor. A protective surface such as painters plastic will also help keep the floor looking good until the doors open. Does the Holo-Floor2 film or Gloss Vinyls leave a residue and how easy is it to remove? Both our Holographic Film and our Gloss Floor Vinyls are made with a special adhesive designed for floor applications. It is very easily removed and because the adhesive is designed to for floors, it will not leave any residue or damage the floor surface in any way. However, the floor itself needs to be up to factory specification for it work properly. In fact, on properly prepared and primed, painted walls, the film can also be safely used without removing paint, etc. We suggest a smooth vinyl floor for optimum results. How is it sold - by the roll, sheet? We have over 20 different patterns to choose from and all priced the same as standard 38 inches wide and lengths in 50 or 100 ft. To calculate how many rolls you will need for your floor, it is best to figure it out by the square foot. For example, if you have a 30 X 30 ft. floor, that is 900 sq. ft. For a 38 in. wide roll (3.2 ft.), you would need approximately 300 ft. of film or 3 rolls. Our Premium Gloss White Floor vinyl has 450 square feet of material per roll - 54 in. W X 100 ft. L.
Holo-Walls also offers custom lamination to almost any material such as polycarbonate, Sintra type materials, foam boards and many other smooth substrates.